For all of my life, once I have a definiteness of purpose, it’s easy. Once I have made a decision to do something, I find that I’m already halfway done with the battle. I have only left to execute. 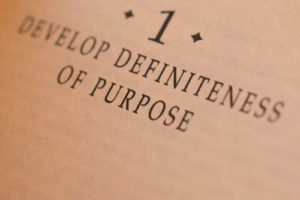 One of Napoleon Hill’s principles is the concept of definiteness of purpose. With it comes the “burning desire” to accomplish what you want. He talks most specifically about careers, as his magnum opus is Think and Grow Rich, but the principle applies to our lives in general. Back when I wanted to backpacked, I read that the hardest part is deciding to travel. After that it’s easy. Does that logic not apply to the whatever we want to do? Once we decide what we want to do, we have reached the burning desire of definiteness of purpose. Our definiteness of purpose concisely directs us toward our path. Our path leads us to our purpose. We have laser focus. 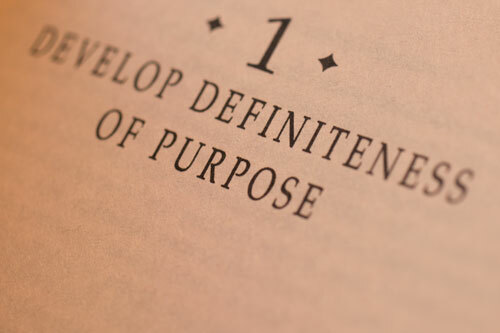 Why is a definiteness of purpose important? It’s the “what”. If we’re runners and have decided to run a marathon, it gives purpose to our runs. If we decide we want to become the best insurance salesperson, it gives purpose to our business. If we decide to become a doctor, it gives purpose to our studies. I decided I wanted to travel. When we first decide to travel abroad, we have a laundry list of tasks (especially in an exotic location, such as Southeast Asia). We need a passport, we may need visas before we reach the border, we need vaccines, we need a go bag, we need a plan (that’s personal experience talking…), we probably should have some idea of local customs, and so forth. Once I had that definiteness of purpose, it became easy to plan. The point of a definiteness of purpose is to establish a plan and execute. It transcends going through the motions of our day-to-day lives and gives us purpose, energy, and enthusiasm. I have never been so enthusiastic about writing as I am now with this blog. I has created ab infectious enthusiasm that’s kept me up at night. The definiteness of purpose of my blog (which is simply to discuss my thoughts and share them with you) has made this endeavor fun, easy, and simplistic. An effective blog doesn’t have to require glamor, with a bevy of bells and whistles. It’s purpose is getting thoughts online for viewers to read. I have not discussed careers. Life is more than what we do for a living. I’m a firm believer in living our lives as we want. We can work for someone or for ourselves. We can be a solopreneur, or start a Fortune 50 company. I believe it’s important to live life on our own terms. Maybe our definiteness of purpose is our career or maybe our career supports our definiteness of purpose. Only we can decide. Develop definiteness of purpose. Haha, telling a photographer to “develop” something.